When you are planning a big move, you need to conserve as much space as you can to ensure that everything fits. After all, there’s a lot to pack and store, and you want to keep your rental needs as minimal as possible. 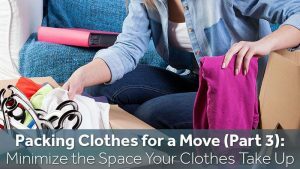 That may mean rethinking the way you pack some items — like your clothes. Until you begin packing, you may not realize how much space your clothes take up. Think about it: your closet is jammed packed (and maybe the closet in the spare room too), your dresser drawers are stuffed, and maybe you have a few under the bed containers hidden beneath your mattress. That doesn’t account for the plunder of jackets and coats hanging in the mudroom or your seasonal threads hidden away in the basement. If you are like most of us, your family’s clothes are taking up a lot more space in your home than you realize. Now, all of those clothing pieces need to be packed and stored before, during, and even after the big move. What’s a stressed and overwhelmed person to do? Once you have ridden yourself of those burdensome extras, you will want to carefully sort all of your clothing, packing seasonal pieces first. Start with those off-season clothes you won’t need for months, and get them folded and packed neatly in boxes where they can be forgotten until needed. Next, sort the leftovers, not piles of must-haves that you’ll need to get your hands on right away (like PJ’s, undergarments, and a few initial outfits). Be sure to mark this box clearly for quick retrieval when you get to your new home. Fold the remaining stacks into piles that will be stored together in your new home (this makes unpacking much easier). For instance, if all of your t-shirts get rolled and put away in dresser drawers, then pack them that way, so all you have to do is open the box and pull them out when you arrive. Pack clothing boxes tightly. Fabrics aren’t breakable, so don’t worry about packing items to the top of the box (they won’t get hurt by accidentally dropping a box). Just be sure that the lid can easily close and be sealed without damaging any pieces. Hang easily wrinkled items. Those dresses and suits will transport much more easily in a wardrobe box. Be sure to have several ready. Remember, larger clothing items take up a lot more space than you think.Jackets and coats are bulky and voluminous. Be sure to have a few extra-large boxes available to accommodate them. Start Early. Packing clothing may seem like a quick and easy job — that is until you get started. Be sure to leave enough time for this important job. 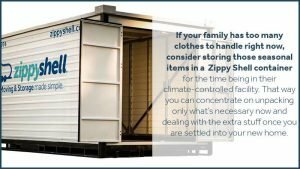 If your family has too many clothes to handle right now, consider storing those seasonal items in a Zippy Shell container for the time being in their climate-controlled facility. That way you can concentrate on unpacking only what’s necessary now and dealing with the extra stuff once you are settled into your new home. Make your next move as simple and stress-free as possible by calling in the experts at Zippy Shell. Offering onsite packing containers that can be moved to your new locations or stored until later, Zippy Shell can handle every aspect of your move. Call us today at Zippy Shell Greater Columbus for a free estimate!